Robert Anton Wilson (1932-NEVER) One of the most profound and important scientific philosophers of this century, Wilson has written many very important works of fiction and non-fiction. His vast intelligence and sharp wit are sufficient to shock and enlighten even the the most heavily imprinted domesticated primate nervous system. A succinct diagram representing the fundamental attitudes assumed by most of the animals including us. An important key to understanding human behavior. RAW's rendition of Leary's 8-circuit model of human consciousness. Summary of the connection between Dope and Divinity. Richard Metzger and Genesis P-Orridge interview Robert Anton Wilson in a 2-part Infinity Factory on Nov. 7, 1997, 1.5 hours. RAW attends a SubGenius Devival in Austin includes images and video! 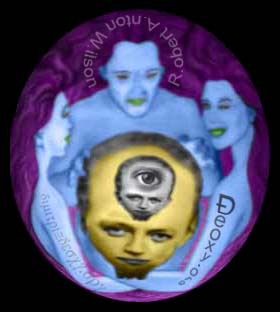 The Official® Robert Anton Wilson Homepage! New Falcon Publications catalog of Robet Anton Wilson's books, including one of the most important book of the 20th Century Prometheus Rising. SoundPhotosynthesis Robert Anton Wilson audio/video catalog. Impermanent Press offers audio, video, books and more not available in any store. RAW's own newsletter Trajectories, The Journal of Futurism and Heresy!